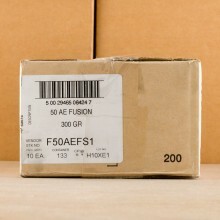 BULK .50 AE AMMO SHIPS FOR FREE! The 50 AE round is not for the faint of heart. Action Arms developed the round in the late 1980's and today it still stands as one of the most powerful handgun rounds available. 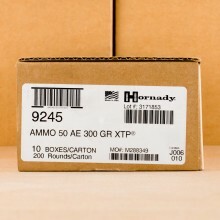 With bullets ranging from 300 to 325 grain, the 50 Action Express is commonly paired with a Desert Eagle delivering muzzle velocities in excess of 1,300 feet per second.